The Rome Masters is a tennis tournament held in Rome once a year. The men’s competition is an event on the ATP tour ( it stays for Association of Tennis Professionals). The women’s competition is an event on the WTA tour (it stays for Women’s Tennis Association). The two competitions are held in separate weeks in May. The men’s competition will be held from May 3rd (with the singles qualifying) to May 11th, while the women’s competition will be held from May 10th to May 18th(with the final). The tournament is played on clay courts. It is considered by many tennis fans to be the second most prestigious clay court tennis tournament in the world, after the French Open. From 1930 to 1934 the Italian tennis championship was held in Milan; in 1935 it was moved to the Foro Italico in Rome. But from the following year to 1949 there weren’t held any events. It resumed in 1950 and in 1969 it became an “Open” event. It was known as the Italian Open until 2001; in 2002 it changed its name and now it is known as the Internazionali BNL d’Italia. This year all the best tennis players will compete in Rome, making the 2008 Internazionali BNL d’Italia one of the biggest editions which have ever been played. Infact, the first 44 players in the ATP ranking and 28 of the first 30 players in the WTA ranking will compete in the 2008 Internazionali d’Italia. Concerning the women’s competition, last year Jelena Jankowic took the Rome title without losing a set, becoming the Queen of Rome. She defeated world number 2 Svetlana Kuznetsova for 7-5/6-1. Chris Evert is the player who has won more Rome titles(five), even if Conchita Martinez was the only one to win four consecutive titles. As regards the men’s competition, in 2007 Rafael Nadal defeated Fernando Gonzalez 6-2, 6-2 in the final. He has won three consecutive Rome titles; no one has been able to do the same in the Open era. Even if he is “only” ATP World number 2, he has demonstrated his clay-court strength. Before Nadal, the last winner in Rome was the Spanish Carlos Moya who defeated the Argentinian David Nalbandian in the final in 2004. If you happen to be in Rome in May, do not miss this sports spectacle. This is an amazing tennis show, that will bring excitement, joy and happiness with a real competition spirit. Book your stay in Rome and straight away to the courts. On April the 21th is celebrated in Rome the legendary foundation of the City. According to legend, the foundation took place in 753 BC. The tradition says that the founders of Rome were the twins Romulus and Remus. Romulus and Remus were sons of Rea Silvia. She was the daughter of Numitor, king of Alba Longa. But Amulius, Numitor’s younger brother, in order to take the throne, expelled Numitor and forced Rea Silvia to become a Vestal virgin. This would prevent any threat from her children, he thought. Nevertheless Rea Silvia conceived by intervention of gods and gave birth to twins, Amulius ordered the boys to be thrown into the river Tiber in a basket. Romulus and Remus survived the attempt on their lives, however. They landed on a riverbank and were saved by a she-wolf. The twins are often pictured drinking the wolf’s milk. Recently there has been some polemic on whether Italian archeologist found the place where she-wolf saved the twins on the Capitoline Hill. Faustulus, a shepherd, found the twins and raised them. 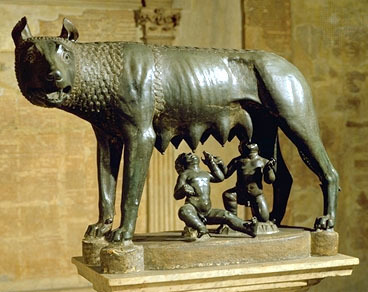 When time arrived and they were old enough, Romulus and Remus took their revenge on Amulius. They killed him and restored their grandfather Numitor as king of Alba Longa. Romulus and Remus decided to found their own city in the land in which they had grown up. They argued about exactly where to start building and the rule of it, and eventually Romulus killed Remus. Hence Romulus actually founded Rome. They were believed to be descendants of the Trojan hero Aeneas. Beautiful story, don’t you think? In this Myth there are many interesting coincidences with other sacred stories: a virginal conception by divine intervention (Christ), babies left in a basket on a river (Moises), one brother’s killing (Cain and Abel). The fact that the twins were raised by a shepherd remind us the main activity of the first member of roman community. So, visit Rome in April. Enjoy variety of Special offers of fancy YES HOTEL, and wish Happy Birthday to ROMA- Eternal and always Gourgeous! Today I would like to talk with you about a small town, situated not too far away from Rome. ARICCIA! Even if Ariccia is a small town, it is possible to relax spend some great time there, something different and extremely delicious: to eat some “porchetta” in a Fraschetta a place that you can find only in Lazio region. Ariccia was a pre-roman village situated inside the area called “ Roman’s Castles”. The origin of Fraschetta goes back to the times of ancient Rome when people who where travelling needed some place to have rest, eat, in other words to gain energy to continue travels, but it was only during the Middle Ages that this place acquired the name of Fraschetta. It takes origin from another local town, named Frascati. In fact, local viticulturists started to put fronds outside the doors to indicate the solace place and to let people know that the new wine was ready to be drunk. And so, originally, people could only drink there some wine and have some light snacks, like boiled eggs, but slowly the owners of these places started to sell bread and porchetta. Porchetta is a very famous dish of Italian cuisine: the pork is staffed with aromatic herbs and entrails. I can assure you. It is really tasty! Yammiiiiii…..
Today the Fraschetta is a simple place where one can have a good lunch without frills, typical wine served in carafe and a lot of horse d’ouvre like: “mozzarella di bufala”, sausages, ham, onion, pepper, cheese ,fresh bread and porchetta. You will pay almost nothing for all this staff, and the portions are really big, so don’t exaggerate! Be moderate! After that you can have homemade “Pappardelle al sugo di cinghiale” or “ Fettuccine al ragù” and finally some good Roasted meet. Still some place in your stomach? Wine again and Tozzetti….Here we go! And once you’re done with it, in order to digest all these enogastronomic masterpieces of Ariccia, why don’t you spend some time having a walk in the famous bridge of Ariccia or visiting Chigi Palace and Santa Maria Assunta, church designed by Bernini. Why don’t go to have a walk in the Appia’s Park that comprises 15 villages and towns like Ariccia.. So, again, Enjoy the lunch and stay in perfect shape. You are looking forward to move to Italy? But you are not sure what enterprise to jump in ? What can Italy and Rome offer you in terms of professional growth. And the answer is… You will find it in Rome from 11th to 13th April at the Sixth Edition of Roman Fair on Franchising. The sixth edition of Rome Expo entire dedicated to the Franchising will be kept to the New Fair of Rome from the 11 to the 13 of April. The annual exposition and showroom of the Franchising , Rome Expo Franchising is one of the most important and completed events that are dedicated to this field. Nearly all from that sector interested from the formula of Franchising will be presented in Rome Expo Franchising, in order to represent better and more real the inclined market and adopt this way of trade and commercial . Among the many industries represented in the Expo are : the real estate industry, the tourism, the foods, the furnishing, computer science and many many more so it completes the variety of offers in that multinational event. The strategic position of the New Fair of Rome represents one of the winning events of the manifestation Rome Expo Franchising, able event to be involved coming professionals from all over the world. Been born on initiative of Italian FIF-Federazione Franchising and the Confesercenti of Rome, Rome Expo Franchising receives the more important franchisor, specialized professional figures, experts of affiliation trades , important points of reference for all the franchisee that wish to obtain precious suggestions for the management and promotion of their own activity. Fields : hotels, footwear and accessories, games and other products for the kids, furniture; publicity and communication; services and products for the house; movierent; consultancy; pets; furnishings and complements of furnishings; car and motion; paper and office supplies ; advising; ; distribution; computer science, telecomunivation, electronics; laundry; jewelry shops and goldsmiths; optica and video; restorants; health and well-being; company serveces; personal services; real estate services; post services; sport and free time; travels and tourism; media; associations, agencies, fairs. The show is also about the development and the affirmation of the small and averages enterprises, where they will be able offer their products and services free of charge. They will appear with just a stand in which a selection will be exhibited of marks Italians called R&F Italy, to the foreign country through the representation of the Rome Expo Franchising that will participate to similar shows in Beijing, Moscow, Kiev, Bucharest and New Delhi and through the support of the ICE and Ministry of Foreign Trade. Important point of reference for all the franchisee that try a brand to which affiliating themselves and on which investing, ambisce to satisfy the car-employment proposals and of innovation of the field they trades. To such purpose it is like a springboard of launch for all those who wish through the franchising to give life to a productive and profitable working activity. In order to inform and to support the future franchisee in their choices, the Rome Expo Franchising dedicates particular attention to the organization of workshop, conventions and seminaries coordinate to you from important exponents of the world of the franchising. The event always takes under consideration the international markets like resource for national the economic development. In cooperation with the Ministry of the International Commerce and with the Institute of the Foreign trade, a plan of international promotion was created with the aim to attract the greater possible number of investors and buyers interested to develop their businesses into Italy and foreign countries. The promotional plan strongly previews the cover of strategic countries and in phase development among which are Russia, China, Romania, India, Ucraine as well as Spain, France and Greece. ° From Termini Station: the Roma-Fiumicino railway line is due to be upgraded, and on the occasion of the inauguration, a dedicated new Fair stop ("Fiera") will be opened. Journey time: 20 minutes approximately. ° From the centre of Rome (Piazza Venezia): the expo may be currently reached from Magliana. Two inbound and outbound access roads are under construction and due to be soon completed at the section between the GRA (Rome’s orbital road) and the Citavecchia Motorway junction, which will allow visitors to easily reach the new Fair by car. Journey time: 20 minutes approximately. The strategic location of the new Fair will allow trade members and visitors to make the most of their stay in the Capital, allowing for an optimum balance between business and leisure. Hi friends, here is your friend –big- mouth knows -all about- it . During one of my tours around the wonderful Eternal city of Rome , after I was duly impressed by my visit to the great Rome Pantheon followed by the very interesting walk into and around the Rome Church of San Ignazio di Loyola (Where there is a great masterpiece of 3d conception) I found out something else altogether which was no less interesting. You would suppose that an Ice cream Parlour that appears in every travel guide is only for tourist people that go to fancy places and ignore all about the secrets of the “natives” , the romans in our case. Well, you would be wrong to assume so… Indeed the Roman ice cream parlour Giolitti at Via del Vicario 44 is probably the best ice cream shop in town. Be bold and and you may try any flavour : you will not be disappointed, and do not forget to add the delicious panna on top (cream). For those who really crave ice cream there is one special ice cream of almost 90 cm long. You can see lots of clerks and all kinds of local people crowding the place including the famous. The other day on my way to Giolitti I bumped into the popular Italian singer Renato Zero, who was also cruising to the ice cream place. I said hi, he replied pleasantly with a smile and went on at a leisurely pace to choose his ice cream flavours. There also place for take a seat and relax while you are planning your next visit or tour. It is springtime now that I’m dropping this lines for you fellows, but they told on winter the hot chocolate with panna (cream) is fantastic!!! In front at the Corner Via del Corso and Via del Tritone stands the Alberto Sordi Gallery, which is a beautiful Shopping Mall made within an ancient building . Alberto Sordi is a famous roman actor and in one his movies he played the part of an Italian guy trying to ‘’become’’ an American. Surely the result has to be interesting. Ok, follow my humble advice (!) , take your girlfriend or boyfriend or whoever, or just go by yourself and have some fresh tastes of Rome. Other suggestions of Rome Ice cream shops. And for your stay in Rome why not try our new 3 star Yes Hotel Rome?